A pair of Irish Elk or Giant Deer antlers from the collection of the late Sir Sidney Nolan comes up at Bonhams sporting sale in Edinburgh on May 1. 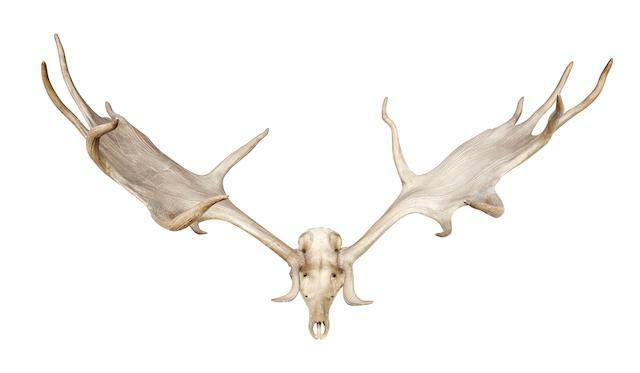 The megalocerus giganteus antlers come with 18 points, skull and some restorations. They are 88 inches wide and estimated at £26,000-30,000. Bonhams list the provenance as the collection of the late Sir Sidney and Lady Nolan at The Rodd. Antlers have long been a feature of Irish and Scottish baronial banqueting halls. Now extinct the Irish elk is one of the largest deers that ever roamed the earth. It lived during the Pleistocene Period of the Great Ice Age (starting 2.6 million years ago and ending 11,700 years ago). This entry was posted on Wednesday, April 3rd, 2019 at 12:07 pm	and is filed under AUCTIONS, COLLECTIBLES. You can follow any responses to this entry through the RSS 2.0 feed. You can leave a response, or trackback from your own site.